Every once in a while, we humans are sent a reminder that we are nothing more than tenants on this gorgeous planet. Irrespective of your views on or dealings with the landlord, and taking into account the size of their property portfolio, it’s inevitable that at times we humble occupants get to experience the effects of their dealing with the day to day running of the place. 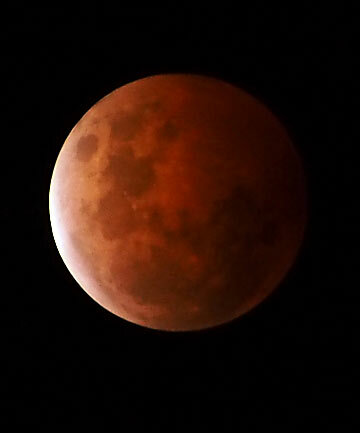 This week’s glimpse of property management came in the form of a lunar eclipse, dramatically referred to as a Blood Moon, and here on the Homestead we had box seats for it. Of course, as we all have a terrible tendency to get caught in the moment, not one of us thought to photograph the event that we observed in various forms of nightdress through the window of The Bean Counter and Milk Maid’s bedroom, but if you were not in such prime seats take it from us: it was pretty awesome. Luckily (and also proving that for one fleeting moment, New Brighton was in the right place at the right time; a temporary desres) heaps of other people, including the daily rag that isn’t often kind to us, were more onto it. 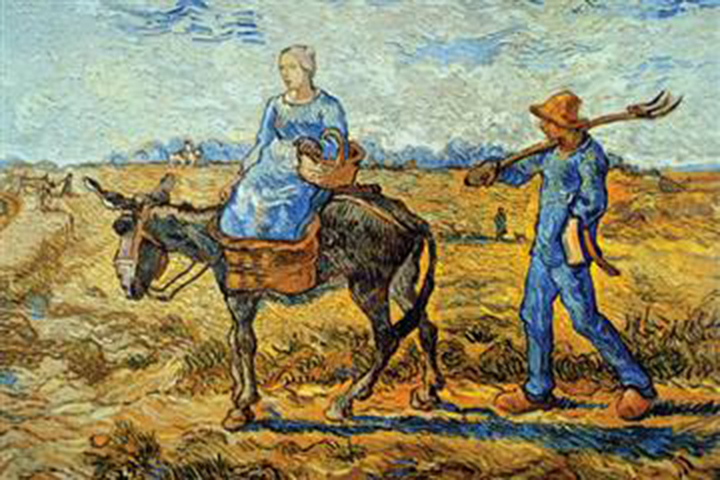 The effect witnessing this amazing event has had on us all is both definitive and unanimous: it’s brought out the peasant in us. To be fair, you barely need to scratch our surface to find our collective inner rustic; a casual glimpse at our family tree reveals agricultural workers all the way, with a smattering of cannon fodder thrown in for good measure. But we digress. The fact is somehow seeing the moon intermittently glow, like an ember in a draft, resonated soundly within us and we’ve hit Till-Sow-Reap overdrive! Of course, a lot of this has to do with it being Spring with it’s rush of warmer days and sprouting seeds, growing goat babies and a week of our own home-grown milk. The universe coming to the party just added a lovely sprinkling of pageantry, like a hearty gallop around the maypole would have had for our ancestors. Since shelling out a considerable amount of hard-earned, closely guarded Homestead dollars on this tool, we have found ourselves extolling it’s wonders on a regular basis. 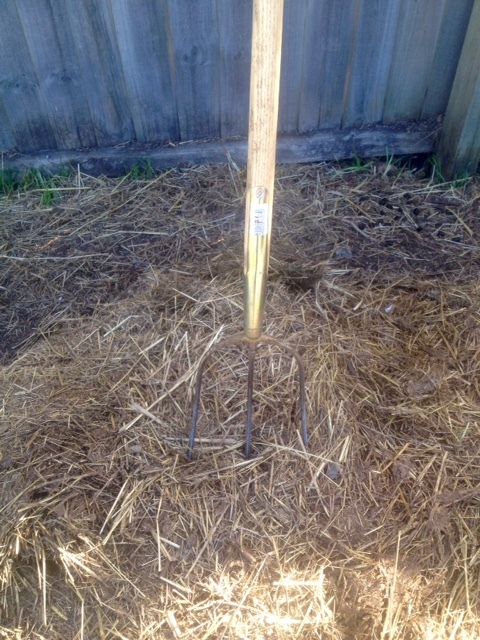 Changing the animal bedding, turning the early-days compost, and moving the goats treat pile is a breeze with this implement. With it’s help, jobs that used to take a morning of heaving, huffing, muttering-of-bad-words hard grunt are done in half the time. 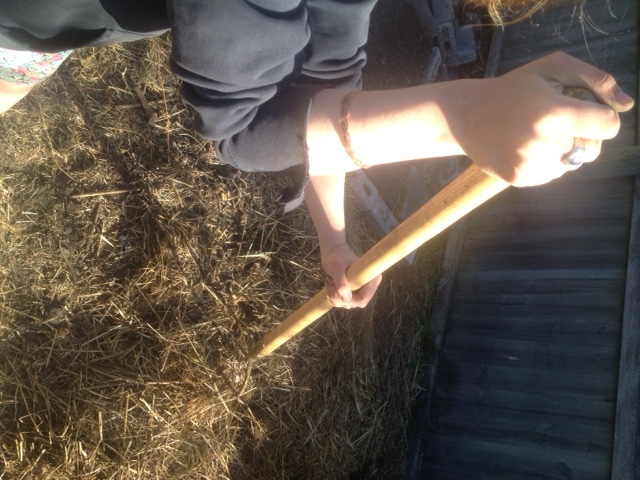 There’s something soul satisfyingly wonderful about tossing forkful after forkful of spent straw bedding into the wheelbarrow, harpooning the load with the pitchfork, and wheeling it, whistling more times than not, to the compost pile. Maybe it’s some weird echo of the joy experienced by our medieval fore-bearers on it’s invention. But if we were being totally, brutally honest, the overwhelming reason we prize our pitchfork is that is makes us feel like the real deal. There’s no debating it, we’re taking this way of life seriously. SEE! We even have a pitchfork! Then, if our chosen tool could not become more adored, Farm Girl selected two of her hero-of-the-moment Jamie Oliver’s DVDs from the library as her holiday viewing treat (quite refreshing after the Frozen marathon of late) and we stumbled upon something we could not have considered in our wildest dreams. Whilst spending time with real life cowboys in Wyoming in Jamie’s American Road Trip, Chef Oliver witnessed the pitchfork being put to a whole new use. Thankfully, Farm Girl’s next birthday is a full year away. We’re not sure where we’d source the cauldron to start with, and then there’s the very real chance of a fire ban, without even starting on the whole health and safety aspect. But it would be fun, don’t you reckon? A dutch oven of baked beans, a pot of strong coffee in the campfire, and several paydays worth of beef fondue-ing on the end of your pitchfork. It’s the sort of thing you’d only do once…in a blood moon. 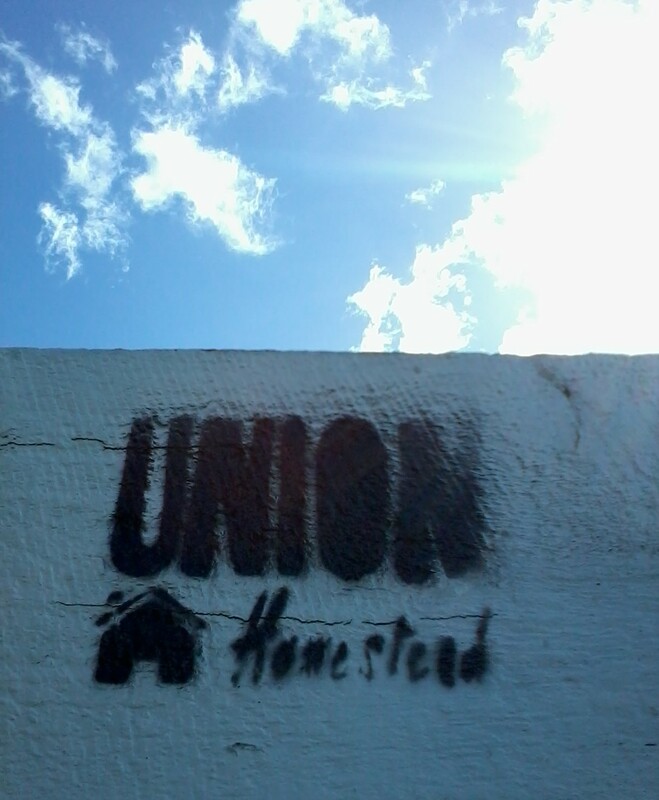 This entry was posted in Family, Garden, Union Homestead and tagged ag lab, Aotearoa, Blood moon, Christchurch, cooking, farm, farming, farmlet, Food, foodies, Goat, goats, Homestead, Homesteader, homesteading, Jamie Oliver, Jamie's American Road Trip, kids, lifestyle, lifestyle block, microfarm, minifarm, New Brighton, New Zealand, Otautahi, pagan, peasants, pitchfork, smallholder, smallholding, steak, The Good Life, tools, urban farm, Wyoming. Bookmark the permalink. Wonderful post. Hubby went out to see if he could see the eclipse the other day, but we had a lot of fog, so no go. I had totally forgotten about the shovel cooking! Perhaps here is where we confess to our practise of TERRIBLE tool care – I wouldn’t even consider eating off any of them,although the temperature of the fat in the Jamie’s cowboy’s cauldron would kill most nasties, I guess. I’ve always been slightly confused by Thanksgiving – I thought it was just before Christmas. Had to smile at the whole frenetic house cleaning…why oh why do we carry out that charade?! I’ve seen Tales from the Green Valley, Victorian, Edwardian and Wartime Farm, Tudor Christmas – and an ad for the new one (Tudor Farm??? ), but not the actual series yet. Also not Victorian Pharmacy. Thanks for the info. No one I have asked today knew that Canada had it’s very own Thanksgiving so I have appeared very knowledgeable, being able to fill them in on all the details. On the other hand, everyone I mentioned sweet potato casserole with marshmallow topping to, while not at all surprised, were in no hurry to source the recipe. I so enjoyed reading this, it made me laugh out loud. The moon was very interesting. I like your pitchfork but I wouldn’t stir a stew with it.